Convient to downtown, clean. Staff is super friendly!!! Where to find Boise hotels near an airport? How can I find hotels in different Boise neighborhoods? 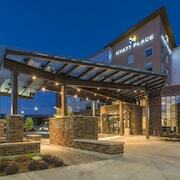 Where can I find hotels in Boise that are near tourist attractions? If you'd like to book upscale or budget accommodations in Boise, it is good to know that there is a wide range of possibilities. Expedia's comprehensive database has 46 hotels within 0.1 kilometres (0.06 miles) of downtown Boise. Travelers hoping to base themselves close to the heart of Boise, can check out the rates and amenities at the Hotel 43 and The Grove Hotel. Meridian is a popular accommodation area. Meridian is 15 kilometres (9 miles) from the heart of Boise and has 10 hotels. Some of the better known of the 10 establishments in this area are the Holiday Inn Express Hotel & Suites Boise West - Meridian and Hampton Inn & Suites Boise Meridian. If you would like to stay in the Caldwell part of Boise, your accommodation options include the Wild Rose Manor Bed and Breakfast and Best Western Plus Caldwell Inn & Suites. Caldwell is 40 kilometres (24 miles) from the heart of Boise. 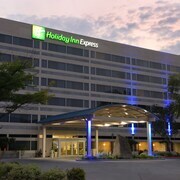 Hotels in Nampa include Holiday Inn Express & Suites Nampa - Idaho Center and Hampton Inn & Suites Boise/Nampa at the Idaho Center. Nampa is 30 kilometres (18 miles) away. The Boise State University and the Idaho State Capitol Building also have accommodation options nearby. 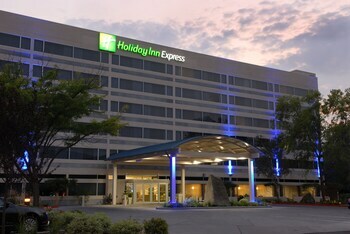 The Hampton Inn & Suites Boise-Downtown and the Residence Inn by Marriott Boise Downtown/University are near the Boise State University and the SpringHill Suites by Marriott Boise ParkCenter and Courtyard by Marriott Downtown Boise are close to the Idaho State Capitol Building. Here at Expedia, we understand that travelers possess varying vacation budgets. So if you are searching for somewhere to base yourself at the more affordable end of the scale, the Boise area features some solid options to choose from. 70 kilometres (42 miles) from Boise's downtown you'll find the Mountain Home Inn. The Best Western Northwest Lodge is just 9 kilometres (6 miles) away. Two more options in the cheaper range of Boise accommodations are the Sleep Inn Nampa and the Sleep Inn Ontario. The The Riverside Hotel is 2 kilometres (2 miles) from the middle of Boise. Or, alternatively, the Oxford Suites Boise can be found 7 kilometres (4 miles) away. The Homewood Suites by Hilton Boise as well as the Hampton Inn & Suites Boise/Spectrum are some alternative places to book accommodation in Boise. If you'd like to experience more of the mountains and valleys in this section of United States of America, you may choose to plan extra nights in other parts of Southern Idaho. You might like to visit regional points of interest or enjoy snowboarding and skiing and then book a comfortable hotel. Downtown Boise is 0.9 kilometres (0.6 miles) to the northwest of Boise and is home to the Boise Art Glass and Woodland Empire Ale Craft. 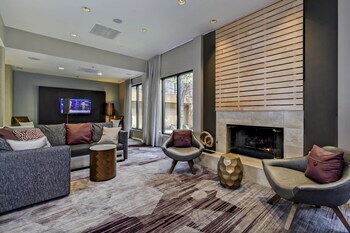 Expedia-listed Downtown Boise hotels and accommodations are the Boise Guest House and TownePlace Suites Boise Downtown. 6 kilometres (4 miles) to the west of Boise, you may also choose to stay at West Boise, home to the Hyatt Place Boise/Towne Square and Hilton Garden Inn Boise Spectrum. Whether you're just passing through or staying in West Boise, a couple of places to add to your itinerary are the Boise Mormon Temple and Aquarium of Boise. Boise Air Terminal Airport is located 5 kilometres (3 miles) from Boise. 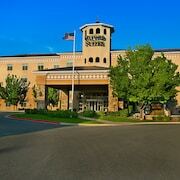 Travelers who wish to stay close by, can book a room at the Comfort Suites Airport or Holiday Inn Boise Airport. What are the most popular Boise hotels? Are there hotels in other cities near Boise? What other types of accommodations are available in Boise? Explore Boise with Expedia.ca’s Travel Guides to find the best flights, cars, holiday packages and more!